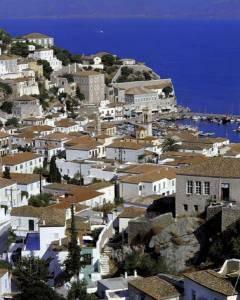 A small cosmopolitan greek island located 35 miles from Zea port (Piraeus), the island of Hydra is one of the few Greek islands where motorized transportation is not permitted … everyone gets about on foot, by donkeys, or with sea taxis; even bicycles are not allowed! It is a favorite spot of many painters, authors, and other artists who seek inspiration from these serene surroundings. Hadjikyriakos Ghikas and Leonard Koen are among two of the most prominent who paved the way for what would become “the island of artists.” The buildings are in traditional style, decorated with wooden painted ceilings, marble fountains, and classic furniture that reminds you of a time long since past. There are beautiful places for swimming, fishing, snorkeling, diving, windsurfing, water skiing, as well as walking and climbing. Small, stylish, charming, and with a great view and convenient location, the Hydra Hotel is the perfect choice for an accommodation with easy access to everything that the town has to offer. The hotel building, once a sponge factory dating to 1860, has been beautifully renovated and features 23 guest rooms and suites, all designed and styled in the typical Hydriot manner.